Needlework can be worked on large or small home accessories such as mats, gift boxes, door stops, bell pulls, and pillows, suitable for a unique and dazzling decorative accent in a Victorian decorating theme. Various sizes and shapes of pillows can be done in needlepoint in many themes and styles -- big bold colorful designs, small flower motifs, or quaint animal designs. Here are examples of original 19th century Berlin wool needlework patterns, perfect to make beautiful and unusual needlepoint pillows. All Berlin patterns are equally adapted for working either in cross or tent stitch. After the design is worked on canvas, examine it carefully to be sure you haven’t missed any stitches. If you have, just fill them in with matching yarn. All sections of the needlework pillow design should be blocked separately before they are stitched together. Seams can be a decorative feature using decorative cording or joined to the backing with an invisible seam. Create this lovely pet accent pillow to add a touch of whimsy to any sofa, chair or bed. 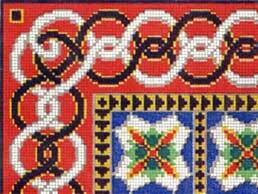 This 1800s original design is for a sofa pillow or footstool to be made in beads or very fine lightweight wool. 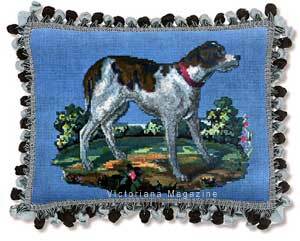 This free pattern for needlepoint pillows is worked on canvas in colorful wools, with floss silk for the lightest shade in the body of the dog and also for the eyes, mouth and collar. Start early to make this as a holiday gift for your favorite pet lover. 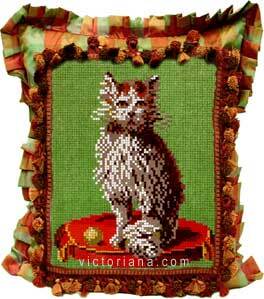 Cat lovers will love this authentic Victorian pattern for needlework. A whimsical, decorative cat pillow is a perfect ornamental addition to any setting – bedroom, living room or sunroom. The free download design features a whiskered cat sitting tall on a fancy cushion on a green background. The background of this whimsical cat pillow can be worked in any color to coordinate with your space. Featuring a hint of British Colonial campaign with a touch of safari, this needlework motif is a great design for a library or den. 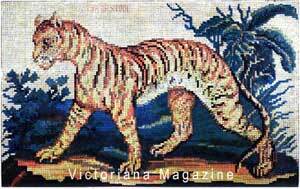 The free tiger needlework pattern was originally distributed in an 1861 ladies’ magazine. The Berlin wool work design includes gorgeous detail with distant backgrounds allowing the focal point of the piece to virtually pop right off the canvas. 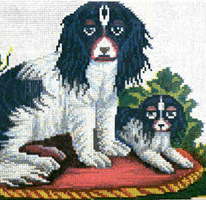 This embroidery pattern was originally designed for a piano stool or footstool that can be worked in cloth or velvet, with chenille or wool. As well, the design can be done on square or rectangular canvas for designer quality needlepoint pillows, the ground filled up with a color to highlight the figure or to coordinate with the room decor. During her secluded and quiet childhood at Kensington Palace, this black-and-tan spaniel was Queen Victoria's constant companion. This berlin pattern can be worked on canvas in the colors shown with the ground filled up with a color to showcase the figures. Start early to create an heirloom holiday gift. There is nothing in the way of finishing touches that makes or mars a home more than the textiles that we put into each room, whether it be the draperies, table covers, or a grouping of colorful throw pillows. This 19th century needlepoint pillow design features geometric shapes and scrolls, highlighting bright and bold colors which can surely match almost any décor.